Working out can sometimes be fun, but it can sometimes be downright boring and difficult. If you have set goals and actually want to achieve something it can be easier to remain motivated, instead of simply exercising because it is healthy or because the doctor said you have to. On common goal, especially among men, is to develop bigger and better defined muscles. Most men believe that it is necessary to train with heavy weights in order to build muscle mass – it’s not! Bodyweight exercises are a great way to build muscle mass without having to buy expensive equipment or go to the gym. How to do tricep pushups? How do I do a tricep dip? How to get big triceps fast at home? How to get biggest triceps? One of the hardest muscles to build is the triceps. There are many different triceps routines on the internet, but how do you know if they actually work? Basically, it often comes down to trial and error when discovering which exercises work best for you. Speak to other, more experienced people, and just get out and try things. The best chest and tricep workout will be one which is wholesome. That is, one which targets every muscle group in the upper body rather than just the chest or the triceps. While it may focus on one of these parts, it is important not to get caught up with trying to train one muscle group, as this will severely stunt results. The best tricep workout and the best exercises for triceps are those which specifically target the back of your arms. Calisthenics are a great place to begin, as they allow the efficient and effective development of muscle mass and strength. Although this may be hard to believe, it simply isn’t necessary to lift heavy weights to build big triceps. If you don’t believe me, then get out and give it a go. I know what I am saying is true simply because I use calisthenics myself every single day. Tricep pushups are one of the great bodyweight tricep exercises. While traditional pushups target the pecs and other chest muscles, tricep pushups really work your arms hard. They are only slightly different to normal pushups, but you will find that you probably won’t be able to complete nearly as many tricep pushups. To do a tricep pushup you need to start in the normal pushup position. Bring your hands closer together until they are placed almost directly below your shoulders. Instead of leaving your elbows pointing outwards, you need to now bring them in so that they are tucked up against your sides. A few reps of this and your arms will be shaking with fatigue! However, it is undoubtedly one of the best ways to build tricep muscle. 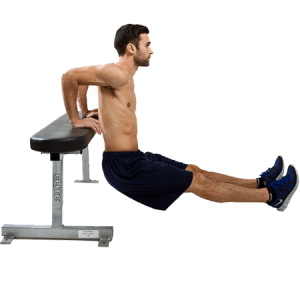 Tricep dips are another one of the great tricep exercises without weights. Like the pushup, they are done by modifying the standard dip slightly. While a lot of dip variations target the back and shoulder muscles, the tricep dip specifically targets the triceps. It is a little hard to explain the exact position that your arms need to be in when completing a tricep dip, so I will leave you to do a quick internet search so you can see the correct technique firsthand. The best tricep exercises for mass are those which are very repetitive and high resistance. Tricep dips are incredible for building tricep mass, and they are one of the most widely used exercises. If you don’t have a dip station then you can do bench dips. While not quite as hard or as beneficial, they will help you tone your triceps and build muscle. Maximizing muscle gain at home is easier said than done. One of the most important thing that you need to consider is your lifestyle. To build healthy, strong muscle, you need to be living a healthy life. This means eating well, working your regularly, and looking after yourself post workout. What equipment do you have, and what exercises does it allow you to do? What is your level, and how experienced are you with various exercises? How much time are you going to be able to dedicate to your workouts long term? Thinking about these three crucial things will go a long way towards making sure that you are able to develop an efficient, high quality workout. Remember, don’t only target the triceps – include all of your upper body muscle groups. Although body weight exercises are great (and don’t get me wrong, they are all I use), you may need to do the occasional triceps workout with dumbbells to achieve maximal size. It can sometimes be difficult to get enough resistance with pure calisthenic training, especially when you are nearing peak strength. The occasional weights workout can help you get your triceps that little bit bigger, and who knows, it may even lead to you having the biggest triceps around! Developing your own body weight workout routine if you are a beginner can sometimes be difficult. The most important thing to remember is that you have to work out every single muscle group in your body to stay healthy and balanced. After all, nothing looks stupider than a guy with a huge upper body and tiny legs, does it? 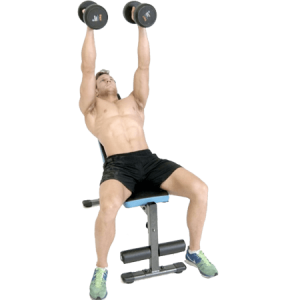 When developing a body weight arm workout, remember to include a number of bicep body weight exercises, chest exercises, and core strength exercises. Doing so will help to make sure that your entire upper body is developed equally, leading to great muscle mass! Also, don’t forget how important eating is. As some wise man, somewhere once said, “working out is only half of the muscle building process.” Okay, we don’t know if any wise man ever said that, but it is true. Having the right diet is extremely important when trying to build muscle and it should never be underestimated.